Green growing vegetation with no thatch such as wheat and clover (top picture) and disked or tilled areas (bottom picture) make ideal firebreaks. Wheat or clover firebreaks also double as food plots for various wildlife species and disked firebreaks are attractive to turkeys and bobwhite for brooding areas. Inadequate firebreaks are a common safety hazard when conducting a prescribed fire and a very likely place for an escape! The firebreak width and composition necessary to conduct your prescribed fire safely should be outlined in your burn plan and firebreaks should be inspected the day of the burn. DO NOT ignite a fire with inadequate firebreaks or if all firebreaks have not been inspected.Mowed cool-season grasses are not ideal firebreaks but they can be used. 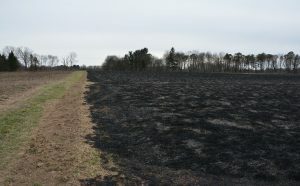 Dead plant material (thatch) can accumulate in cool-season grass firebreaks following mowing, and this could allow the fire to creep through the firebreak. If you do have mowed cool-season grass firebreaks, make sure thatch has not accumulated and watch them closely during the fire to ensure fire doesn’t creep through the break. You should also consider using water to create a “wet-line” firebreak to contain the fire.Bare soil creates the best man-made firebreak. Bare soil firebreaks can be created by disking, tilling, or bulldozing. Empty crop fields, green growing vegetation with no thatch (clover, wheat, alfalfa in the spring), paved, dirt, or gravel roads, and streams, creeks, or rivers also make great firebreaks. In the woods, a leaf blower can be used to remove leaf litter and expose bare mineral soil. Firebreaks should be at least 3 times the width of the adjacent vegetation. In fields of native grasses, firebreaks should be 15-50 feet. By mowing the grasses directly adjacent (10-20 feet) to a firebreak, you can reduce the necessary firebreak width. In the woods, firebreaks only need to be 3-10 feet in width, especially when using only backing fire. Your burn plan should outline who you need to call before and after a prescribed fire. Important people you should call before ignition are the county emergency dispatch (call the non-emergency number), local fire department, and adjacent landowners. 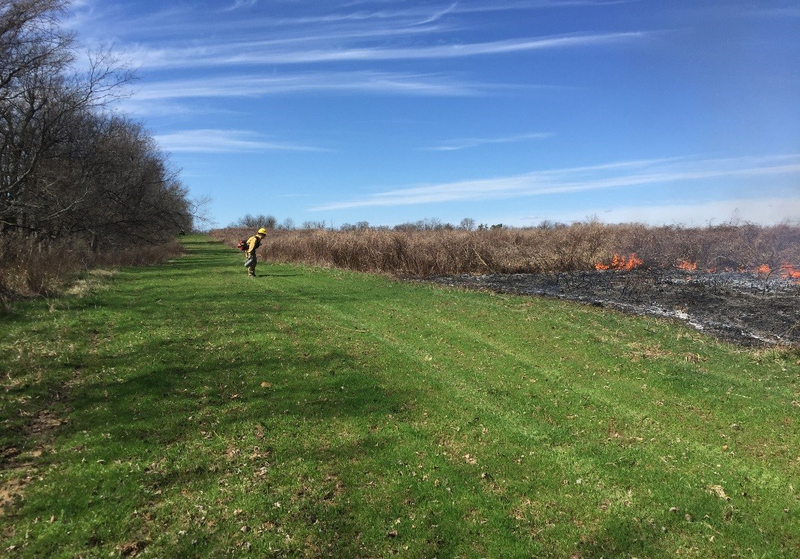 You should also call the county dispatch after the fire is complete and extinguished.Calling the county dispatch and local fire department will make them aware of the prescribed fire and sometimes the local fire department might even be willing to lend a hand! Calling dispatch is important because they will likely receive calls from concerned citizens during the fire. Letting them know ahead of time that it is a “prescribed fire” and is being monitored will reduce the number of unnecessary trips by the local fire department. What are you going to do if the fire escapes? Escapes do happen and you need to know what to do if your fire escapes. This is called a contingency or escaped fire plan and should be outlined in your burn plan. This plan outlines the roles each person plays if the fire escapes and determines at what point additional resources – fire department or others – should be called to assist in the suppression of the fire. Have you done your safety briefing? The last step before ignition of a prescribed fire is the safety briefing. 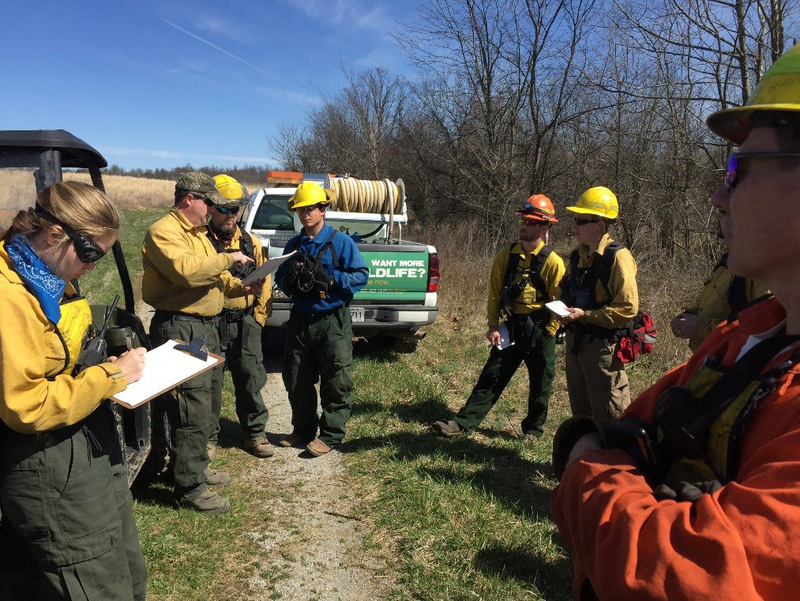 The safety briefing will familiarize personnel with the area, conditions of the firebreaks, weather conditions, radio communication, safety zones and escape routes, contingency plan, and other relevant information.This ensures all the personnel are on the same page when it comes to safely completing the prescribed fire! Safety briefings before ignition help familiarize personnel to the area, weather conditions, and potential hazards and help to ensure the fire is conducted safely. 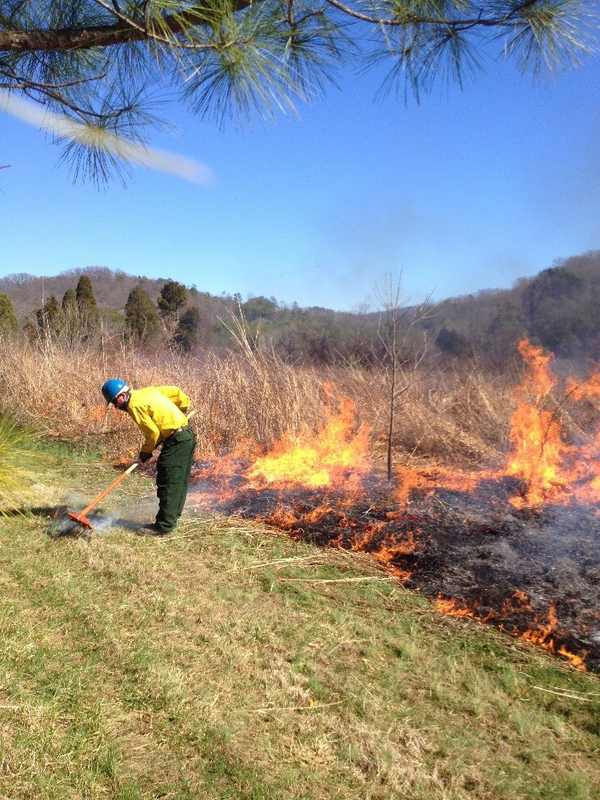 Prescribed fire is an effective management tool, but is only effective if conducted safely! Safety on a prescribed fire is paramount and fires should only be conducted by experienced individuals. 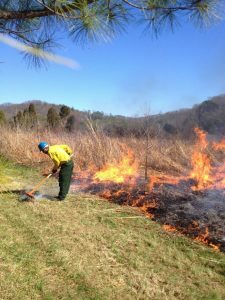 If you are interested in learning more about how and why to use prescribed fire on your property, contact your local IN-DNR wildlife biologist.